Michael MacManus and Evan Hopkins of the Melbourne Guitar Foundation have been busy little bunnies over the summer off-season putting together what I’m sure will be an awesome line-up of concerts and guitar-related awesomeness for the 2015/16 season. And to kick things off they’ve lined up none other than Canberra-based guitar virtuoso Minh Le Hoang on Saturday May 9th at 7pm at St Mary’s Church, 430 Queensberry St, North Melbourne in a program of guitar works inspired by the music of Spain, Latin America and J.S. Bach. The Melbourne Guitar Foundation was created in 2014 to promote and cultivate the classical guitar in Australia through concerts and masterclasses with the world’s most prominent guitarists. This concert, part of the MGF’s second concert season, promotes one of the world’s leading players – Head of guitar studies at the Australian National University and winner of the 50th Tokyo International Guitar Competition, Minh Le Hoang. Minh’s program features many Spanish favourites, including works by Rodrigo, Torroba and Ascencio. He will also present 4 South American Pieces by Garoto, Gismonti and Fernandez and the renowned Lute Suite no.1 by J.S. Bach. 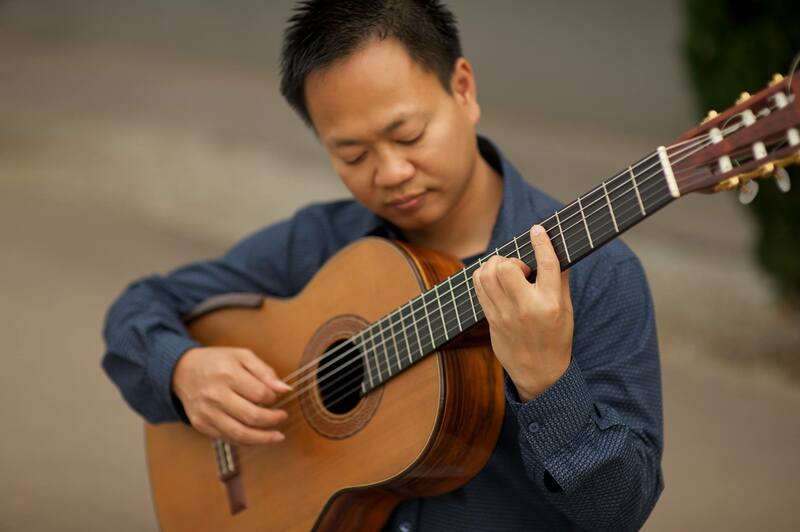 The award-winning Minh Le Hoang has toured throughout the United States, Southeast Asia and Australia both as a soloist and as a member of the leading guitar ensemble, “Guitar Trek”. In 2008 he released the critically acclaimed solo album “The Fall of Birds” and a more recent recording “Duo Merindah” featuring music for guitar and flute. Tickets for the concert may be purchased online at melbourneguitarfoundation.com or at the door. Online tickets are $25 ($20 concession) if booked before April 24. Tickets at the door are $30 ($25 concession). “One of the members of Guitar Trek, Minh Le Hoang established his solo credentials with a dynamic Ginastera Sonata. In an inspired piece of programming, the Ginastera was followed by the charming and under-rated Collectici Intim by Vicente Asencio, the rare juxtaposition of these contrasting middleweights yielding a kaleidoscopic finale.” Paul Fowles – Classical Guitar Magazine. Be sure to head back this way in a couple of weeks folks for an interview with the man himself! Morning folks (or afternoon, or evening depending on where you are in the world!). You may have noticed that I’ve not been posting with quite the regularity in the past couple of weeks that I usually do. That’s because I’ve been super busy doing the moving house thing, whilst simultaneously working interstate for part of the week. That means I’m a very busy bunny at the moment, and unfortunately something has to give (don’t tell anyone I’ve not touched my guitar for a week! Eeek!). Normal service will be resuming in the next couple of weeks though. Some other folks who have also been very busy bunnies are Michael MacManus and Evan Hopkins of the Melbourne Guitar Foundation. You may remember a few months ago I posted up an interview with upcoming young Aussie guitarist Andrew Blanch, on the even of his Melbourne concert presented by the Melbourne Guitar Foundation (and his first Australian tour)?